With the growing trend in mobile usage by millennium and young adults, several startups based around mobile chatting system are on the rise, including Skout, MeetMe, and other niche focused companies. We can expect to see more several mobile advertising and chat platforms on the rise, along with IoT and several app development. If we run regression line analysis on the growth of both desktop and mobile advertising spending, we see the rapid increase trend on mobile ads, while incremental decrease in desktop ads. In 2014, Newzoo.com estimated the growth of mobile advertising spending at nearly $25.8B. As of 2017, from eMarketer research data, the smartphone advertising has reached nearly $28B. In reviewing in-depth advertising revenue origin, the large portion of the advertising revenue originates from the financial mobile advertising (42%,) while retail sales on apparels and clothing at 29%. Interesting enough, large majority of the mobile users are utilizing Amazon app or its website as “product search”. To reach the millennium and growing mobile buyers, developing Apps would be the best recommendation. To develop mobile apps, work with local app development companies. Attend, network and meet mobile advertising firms in developing valuable insights in “how to conduct mobile ads” and “engage mobile users through mobile ads”. 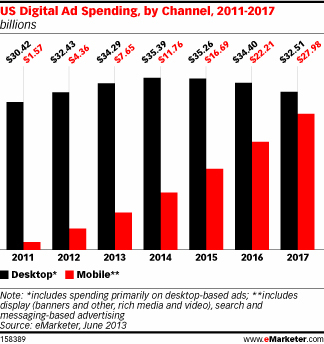 To download the latest eMarketer 2017 data on Mobile Advertising, click here.